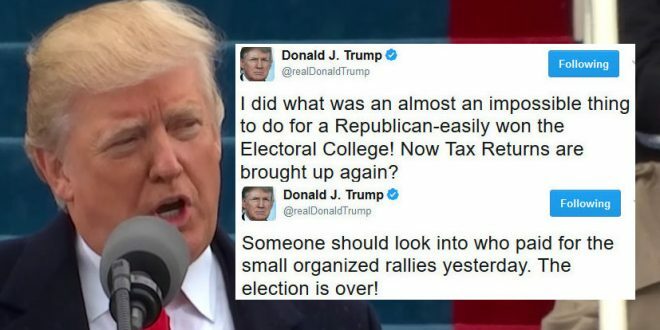 Trump: Yesterday's Tax Return Protesters Were "Paid" - Joe.My.God. “I did what was an almost an impossible thing to do for a Republican – easily won the Electoral College! Now Tax Returns are brought up again?” Recent polls show 74 per cent of Americans want Mr Trump to release his tax returns. Every president since Richard Nixon has made theirs publicly available, but Mr Trump has repeatedly refused to do so. “We’re like your taxes. Unpaid,” wrote one Twitter user in response to the President’s comments, while another wrote: “‘Small’ was your pathetic inauguration crowd”. Yesterday’s “small” protests took place in over 200 cities and in every state.